Horace Walpole’s account of the funeral of George II in 1760 is a mix of pathos and bathos, both sad and and the ridiculous. George II is known for little except the length of his reign (1727-60). However, he has the distinction of being the last reigning British monarch to lead his armies into battle (at the Battle of Dettingen in 1743). His greatest legacy is perhaps the result of his own inadequacy as king. For this allowed powerful ministers to take over government, first in the person of Sir Robert Walopole, the first and longest serving English prime minister, and later under William Pitt the Elder. Do you know I had the curiosity to go to the burying t’other night; I have never seen a royal funeral. Nay, I walked as a rag of quality, which I found would be, and so it was, the easiest way of seeing it. It is absolutely a noble sight. The Prince’s Chamber hung with purple and a quantity of silver lamps, the coffin under a canopy of purple velvet and six vast chandeliers of silver on high stands had a very good effect: the ambassador from Tripoli and his son were carried to see that chamber. The procession through a line of footguards, every seventh man bearing a torch, the horse-guards lining the outside, their officers with drawn sabres and crape sashes, on horseback, the drums muffled, the fifes, bells tolling and minute guns, all this was very solemn. But the charm was the entrance of the Abbey, where we were received by the Dean and chapter in rich copes, the choir and almsmen all bearing torches; the whole Abbey was so illuminated, that one saw it to greater advantage than by day; the tombs, long aisles and fretted roof all appearing distinctly and with the happiest chiaroscuro. There wanted nothing but incense and little chapels here and there with priests saying mass for the repose of the defunct – yet one could not complain of its not being Catholic enough. I had been in dread of being coupled with some boy of ten years old – but the heralds were not very accurate, and I walked with George Grenville, taller and older enough to keep me in countenance. When we came to the chapel of Henry VII all solemnity and decorum ceased – no order was observed, people sat or stood where they could or would, the yeoman of the guard were crying out for help, oppressed by the immense weight of the coffin, the Bishop read sadly, and blundered in the prayers, the fine chapter, Man that is born of a woman , was chanted not read, and the anthem, besides being unmeasurably tedious, would have served as well for a nuptial. The real serious part was the figure of the Duke of Cumberland, heightened by a thousand melancholy circumstances. He had a dark brown Adonis [a type of wig] and a cloak of black cloth with a train of five yards. Attending the funeral of a father, how little reason soever he had to love him, could not be pleasant. His leg extremely bad, yet forced to stand upon it near two hours, his face bloated and distorted with his late paralytic stroke, which has affected too one of his eyes, and place over the mount of the vault, into which in all probability he must himself so soon descend – think how unpleasant a situation! He bore it all with a firm and unaffected countenance. This grave scene was fully contrasted by the burlesque Duke of Newcastle – he fell into a fit of crying the moment he came into the chapel and flung himself back in a stall, the Archbishop hovering over him with a smelling bottle – but in two minutes his curiosity got the better of his hypocrisy and he ran about the chapel with his glass to spy who was or was not there, spying with one hand and mopping his eyes with t’other. Then returned the fear of catching cold, and the Duke of Cumberland, who was sinking with heat, felt himself weighed down, and turning round, found it was the Duke of Newcastle standing upon his train to avoid the chill of the marble. It was very theatric to look down into the vault, where the coffin lay, attended by mourners with lights. Clavering, the Groom of the Bedchamber, refused to sit with the body, and was dismissed by the King’s Order. 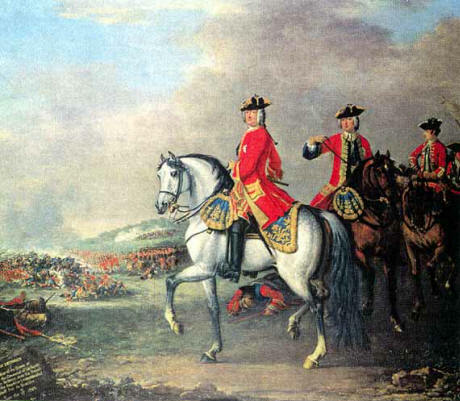 George II at the Battle of Dettingen. He was the last British monarch to lead an army into battle.